I wrote this original writeup two years ago but since that time there have been some pretty awesome upgrades to a lot of these lights. For 2017 I’d definitely recommend Clustar’s Christmas Lights as they are super energy efficient, water and freeze-proof and of all the lights we’ve installed, they have the best quality remote. They are also available in three lights: blue, green and red. 0.1 What Are Holiday Projectors? 2.4 When to Use Fixed Laser Projectors? 2.7 Which Projector Will You Choose? You are probably thinking about your typical projector. Something that helps you watch Sunday football with the boys and make the best of the holidays. Well, this holiday projectors are basically the same thing. Unlike traditional Xmas lighting lasers don’t lose focus and distort shape based on distance. Rather most high quality lasers on the market now project a constant light that is either single-colored. The holiday projector market has exploded in the last five years with manufacturers popping up everywhere. While the majority of Americans haven’t made the transition to laser based systems, I’m confident that in the next twenty years strung up Christmas lights will be a relic of the past. You won’t fall off a ladder and die. Before you jump to buy a laser based system it’s important to realize that there are a couple of major considerations you MUST take into accountbefore buying. The problem with most units is heat. Laser based systems produce tremedous amounts of heat and can quickly overheat. If you buy a cheap projector unit, it will most likely break in the next 5-6 months. Especially if you use it for more than 2-3 hours at once. Be warned. I’m not trying to scare anyone, but I’ve installed hundreds of these things and let me tell you it will happen. If you see a product within the $29.99 range, don’t purchase it. Instead I strongly advise you to go with the $99.99 dollar products. Great question. But generally people don’t. While it’s easy to steal, the majority of humans on the Earth have some moral compunction about stealing your Christmas presents. Do I Need an Extension Cord? Generally most units will have a long enough cord, especially the ones I recommend. However if you need another long cord that’s no problem it’s incredibly easy. I find that anything from 5 to 10 feet works well. Again, if you get a higher quality system the laser light will be quite sharp. This kind of light works differently and it’s a lot easier to keep it focused. Can I Shine It On a White Surface? If you have any more questions please feel free to contact me and ask me whatever you need. With those points out of the way below are three systems that I’ve used and trust. If you want the quick and dirty – skip to the laser product, as it’s the best. One of the most obvious advantages of any laser projector over traditional Christmas lights is that you don’t have to climb up ladders, or fuss around with a staple gun, and least of all spend more time than you’d like putting it up outside (unless you’ve like my neighbor who puts his up around Thanksgiving). This is exactly why I like the Atom Tech Xmas Lights. 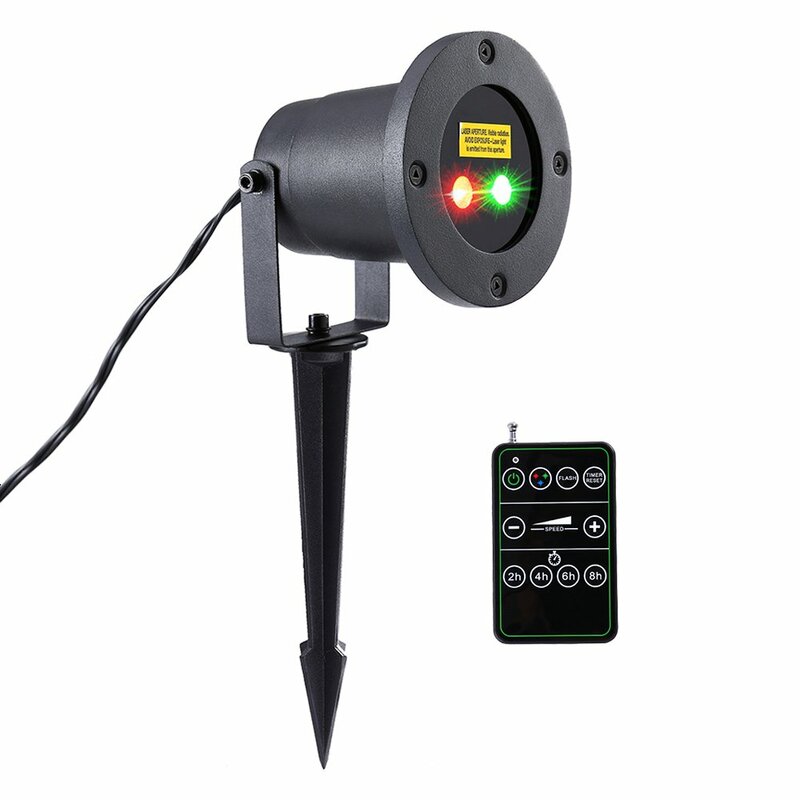 They are like the Ford Focus of holiday lighting, reliable, cost-effective and simple it’s the best model of lighting for anyone interested in simple home/garden laser lighting. It also works really great on trees. Also this projector will consume only a fraction of the juice a traditional incandescent bulb would, which makes saying it’s cost-effective a bit of an understatement. The projector features two laser lights – one green, the other red, letting you decide if you want to use only solid green, solid red, or both, as well as make the lights flash, again separately or together. Durable. Simple. Effective, Atom Tech is the go-to choice for homeowners. Moreover, the module lets you control the speed of the flashes. Once plugged in, it should cover an area over 800 square feet within 32 yards with thousands of green and red stars, letting you liven up your house, trees, shrubbery, or just your lawn. All of the features can be controlled via a remote controller at 65 feet of distance (about 20 meters), though the most effective distance seems to be around 20 feet (6 meters). If the remote isn’t working, first check if the batteries are dead or misaligned; otherwise, try unplugging the projector and plugging it back in. Additionally, the projector comes with an internal timer that lets you set it for 2, 4, 6 or 8-hour ON mode, also controlled via remote. The projector is set within a hardy IP65 waterproof casing (withstands water jets), and is able to endure all types of weather, so you can use it all year ‘round. With this projector, there’ll be no more climbing or bending come Christmas. Use it as an indoor or outdoor decoration, at you discretion. Word of warning – this is a laser, so don’t be going looking directly at it, as you run the risk of damaging your eyes permanently. The Ucharge Christmas Laser Lights Projector bears all the hallmarks of a great holiday projector– it’s merry, it’s versatile, easy to set up, and most importantly, it’s safe. The projector comes with FDA, FCC and IP65 seals of approval, meaning it’s safe to use indoors, safe to set up outdoors, and completely waterproof and “green”. Although, you should still avoid looking directly at it, unless you want to damage your eyes permanently. It’s super easy to install – the only thing to do is drive the stake, mount the Christmas Light Projector, plug it in, and point it (if you haven’t already), and you’re done. Total install time – 3 minutes. The robust die-cast aluminum casing should be able to withstand the elements, allowing you to use it not only for Christmas, but also Halloween, Thanksgiving, Veteran’s Day, Independence Day, Valentine’s Day, weddings, parties, even Groundhog Day (whatever floats your boat). 3 Speed to choose from. 4 Light Modes. Remote Control. High Quality Casing. For your convenience, all of this can be controlled via a user-friendly remote that allows you to switch between the above mentioned patterns modes, and naturally power it on or off. Additionally, the remote also allows you to control the built-in timer, which can run anywhere from an hour to six hours, though the manufacturer recommends that the unit should rest at least half an hour after six hours working. As far as specs go, the projector requires less than 20 Watts of juice, and carries a 120V power adapter and flexibility for UL adaptor 12V DC cables. The Starry Shower Red and Green offers another choice that is of great quality to the above mentioned brands. The only major difference in this unit is the housing and also the stand. Unlike the other units this has a fixed stand that isn’t driven into the ground. When to Use Fixed Laser Projectors? You are worried about it being stolen. You want it fixed to your roof or other apparatus. You don’t want to bother installing it every year. You don’t want to damage your grass. Great for mounting on houses or other buildings when you want to create unique angles. The projector is able to project two colors – green and red, allowing you to choose between using them separately or in conjunction. Moreover, you can choose between two pattern modes – solid color and flashing. Create the magic of Christmas with minimal effort – no climbing up the ladders, no bending, no fuss. 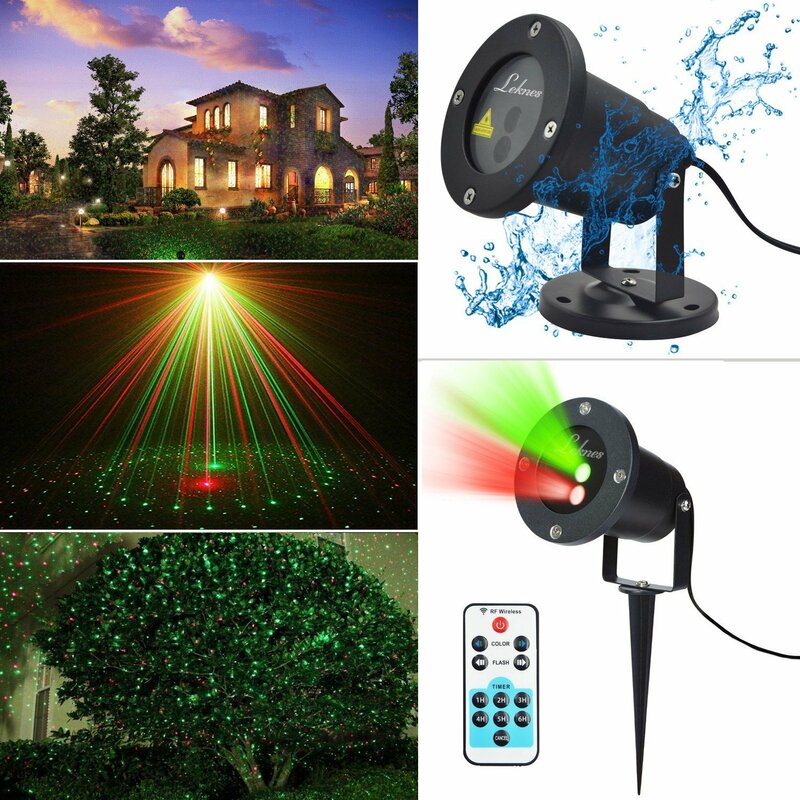 This laser lights projector is able to cover great areas with over a thousand sparkling lights in green or red, allowing you to liven up your house from inside or out, shrubbery, patio, lawn or the neighbor’s garage. Just make sure that you don’t point the light at the sky (without explicit FDA and FCC permits), as it might blind pilots, or flash it at anyone (yourself included) directly to avoid long-lasting damage to your retinas. The product also comes with a multifunction remote controller, allowing you to switch it on or off, change between modes, as well as set the internal timer. The timer enables you to control for how long you want the light to be on (up to six hours) without actually controlling it. Just set it and forget it. Even if you keep it working throughout the day (with at least 30 minutes of rest time between two six-hour bouts), the power consumption will only be a fraction of that of a standard incandescent light bulb. This unit and most others will automatically turn off if on for more than 3-4 hours. The module is made of durable aluminum, completely waterproof and elegant, so you could use it throughout the year – for outdoor weddings and indoor parties, Christmas, New Year’s, Valentine’s Day, Veteran’s Day, Independence Day, Groundhog Day, Thanksgiving, Halloween, or as a support for your band’s first gig. 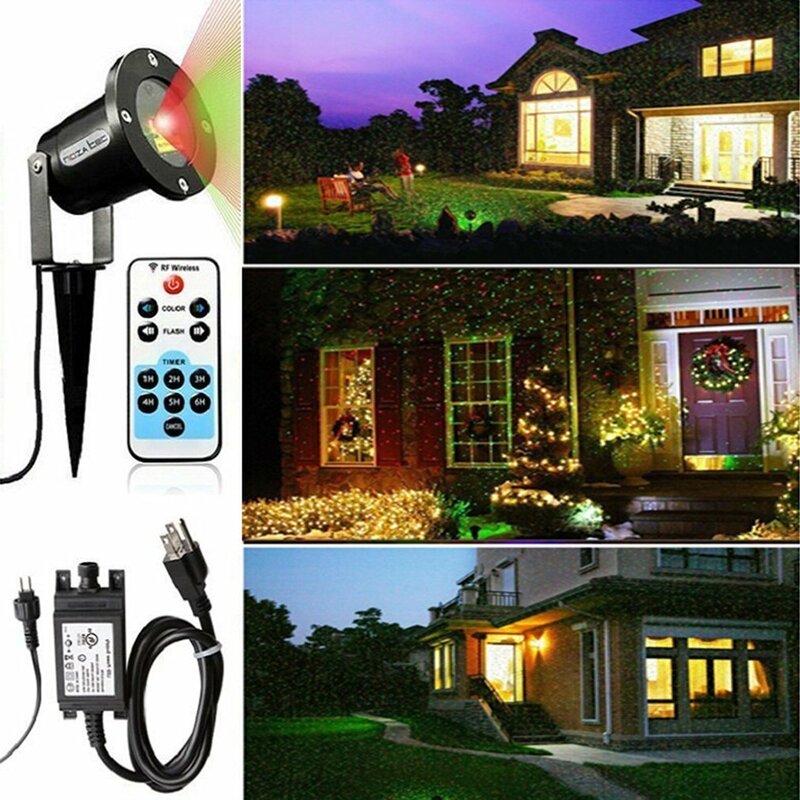 If you’re not squeamish about shelling out a bit more for better quality and versatility in a Christmas Lights Projector , the Remote Controllable RGB Laser Outdoor Garden Landscape Light (Red, Green and Blue) by Ledmall might just be the thing for you. The projector is exactly what it says on the tin – a great outdoor decoration perfectly able to replace a standard landscape light or hundreds of feet worth string lighting all on its own. The stylish, sleek and sturdy all-metal casing for this laser lights projector is made of aluminum, and meets the IP65 waterproof standard, so you can’t rest assured that it will endure all kinds of weather. This makes it ideal not only for Christmas, but other seasons and holidays. The beam this Christmas light projector projects is extremely bright and able to cover over 2000 square feet in over a thousand blue, red and green dots, with two pattern modes and several color combinations. Moreover, the remote allows you to set the internal timer for one of four periods – 2, 4, 6 or 8-hour. If you’re concerned about the power bill – don’t be. The projector draws less than ninety per cent the amount of power than a classic incandescent light bulb, so it’s safe to keep it on throughout the day, with letting it cool down between shows. The projector comes with a 25-feet (7.62 meters) power cord, to make your job of moving it about and positioning all the easier. Which Projector Will You Choose? While I only explained a couple of choices, these are by far my personal favorites. Again, the most important thing to consider about choosing a laser projector is the quality. The basic structure of these units make them very easy to overheat. If you buy cheap quality you’ll only be able to use it for a year (generally). Investing in a higher quality unit will allow you to use it for 3-4 years. I hope this has been helpful for everyone and if you need any help please feel free to contact me. You could point it towards the bushes and trees so that it replicates the effect of strung up traditional lights, or make it look like a swarm of fireflies has landed and decided to throw a party of their own. You might point it at your lawn and make the grass come alive with sparkles. This is guaranteed to thrill the kids. You could also point it towards your house and liven it up with a myriad of blue, green and red dots.